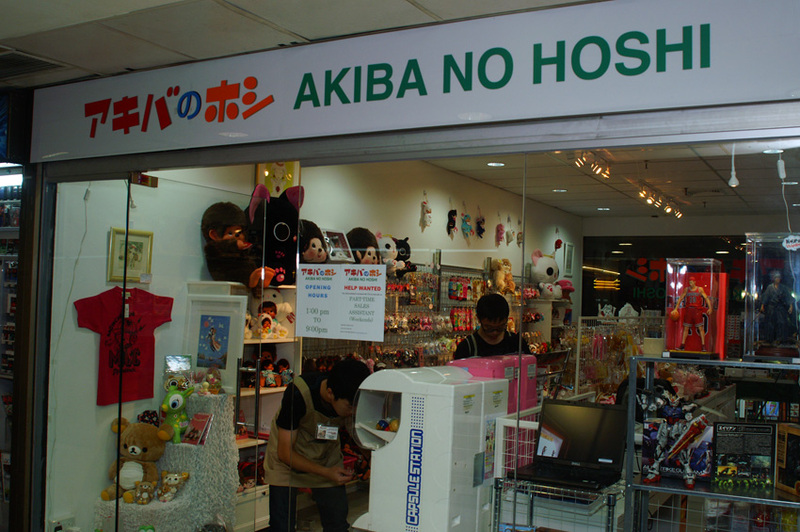 Just that folks may not be aware, there is a new shop selling Japanese products in Singapore! 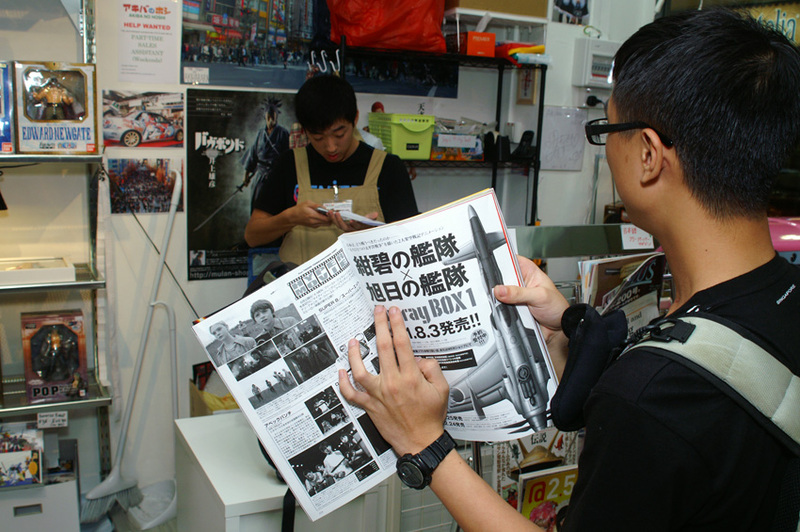 アキバのホシ/Akiba no Hoshi, translated as Akiba’s Star, opened in June 2011 by three Japanese expatriates who shuttle frequently between their home country, Taiwan, Singapore and China. 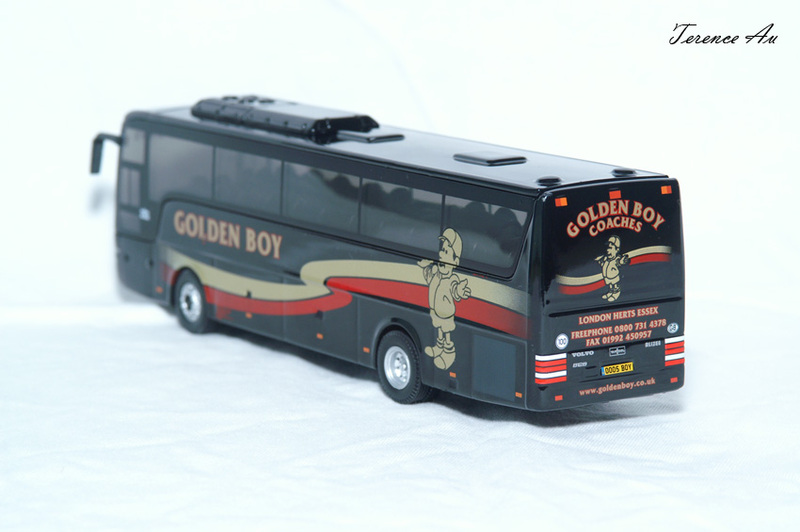 Minibus Group is honored to do a little promotion for them (at no cost!) and hope that readers can give this shop a visit! Address and how-to-get-there is included at the end of this post. 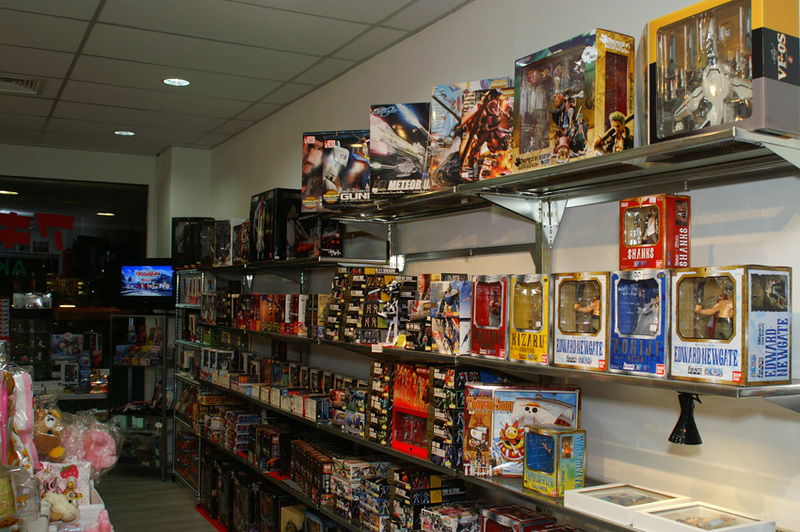 The figurines and model kits section. 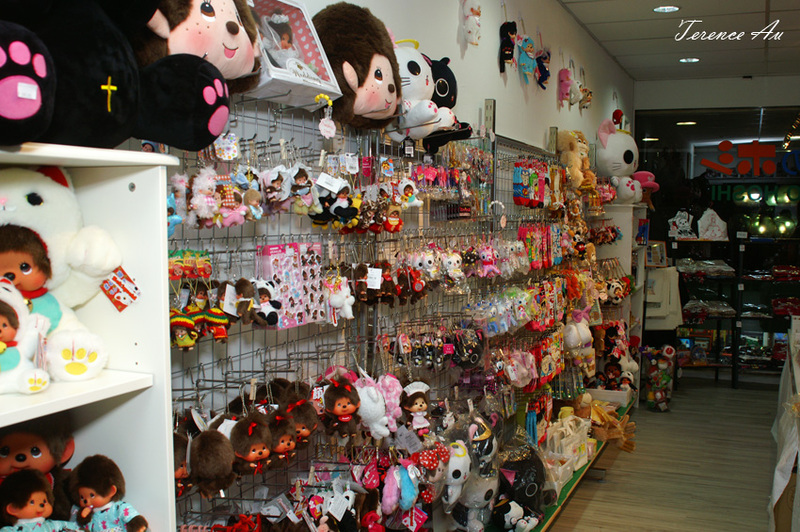 Cute collections of key-chains, accessories are placed on the opposite end. 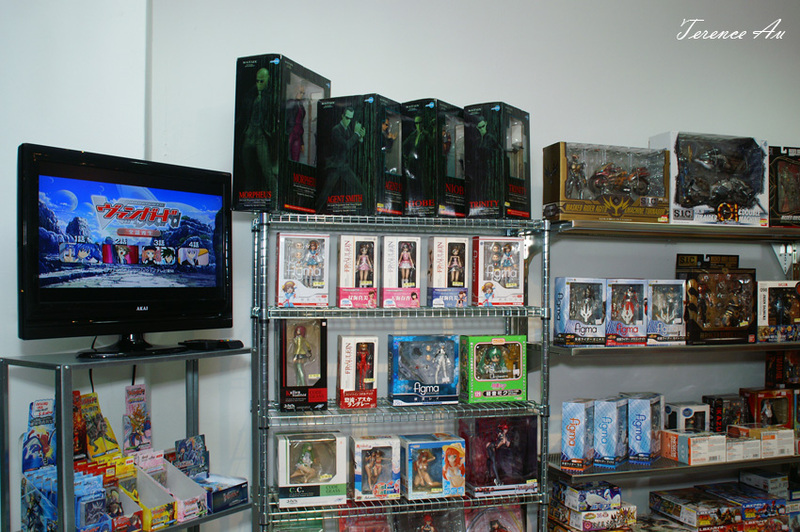 Selection of figurines including figma are lined up near the window. How to read this? Courtesy of Willis Lim. 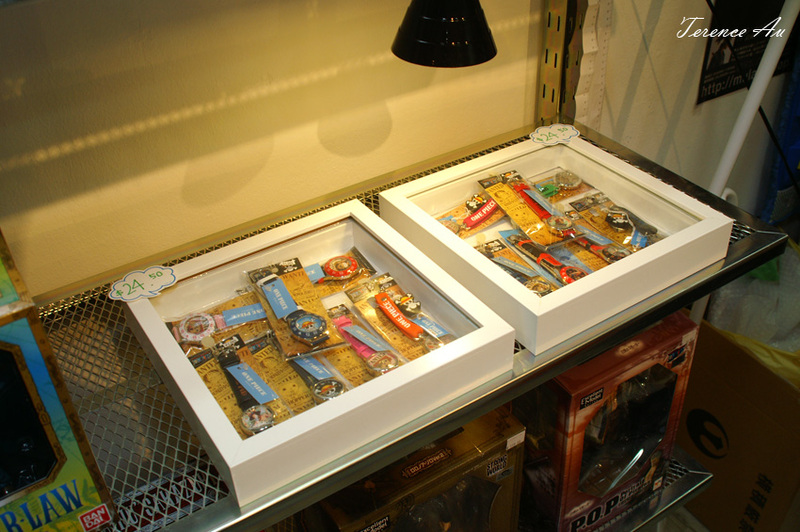 Watches and figurines from One Piece. 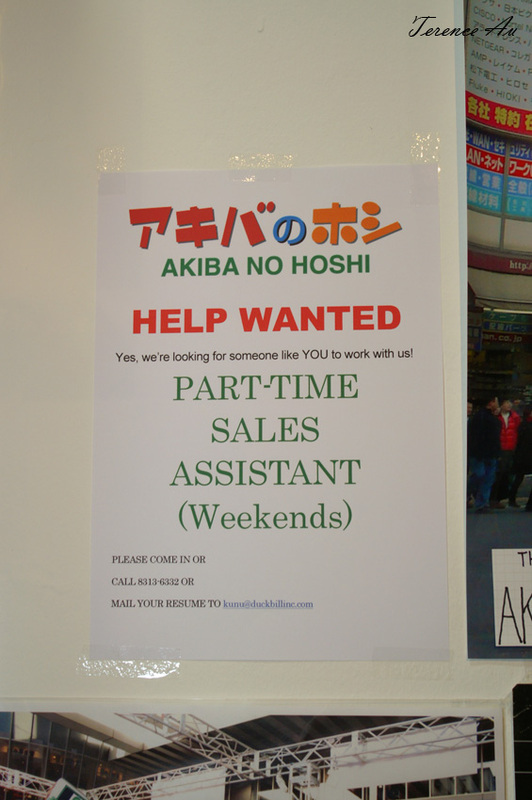 Akiba is looking for more helpers, if you are interested, do give it a try! 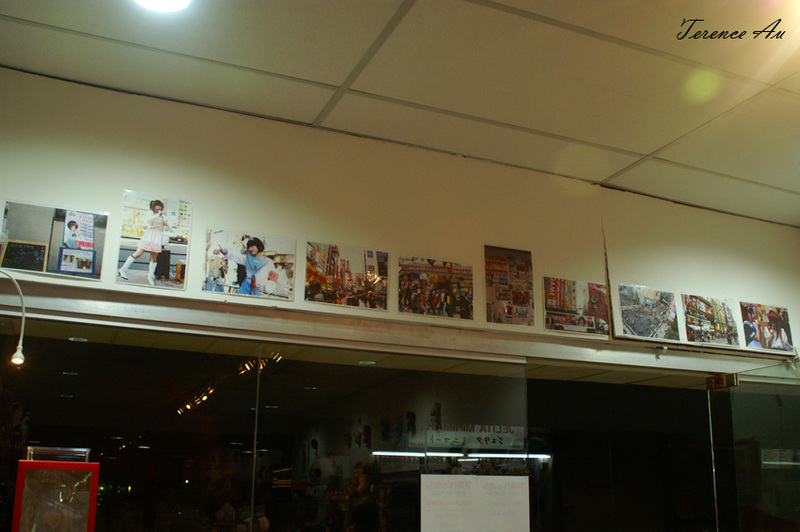 Snapshots of 秋葉原/Akihabara line up the upper portion of the store. 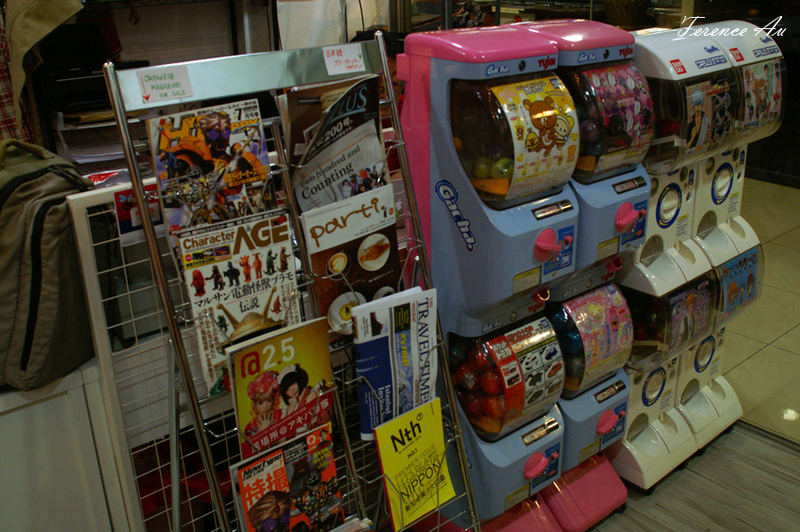 Japanese magazines and Gachapon make their appearance next to the cashier. 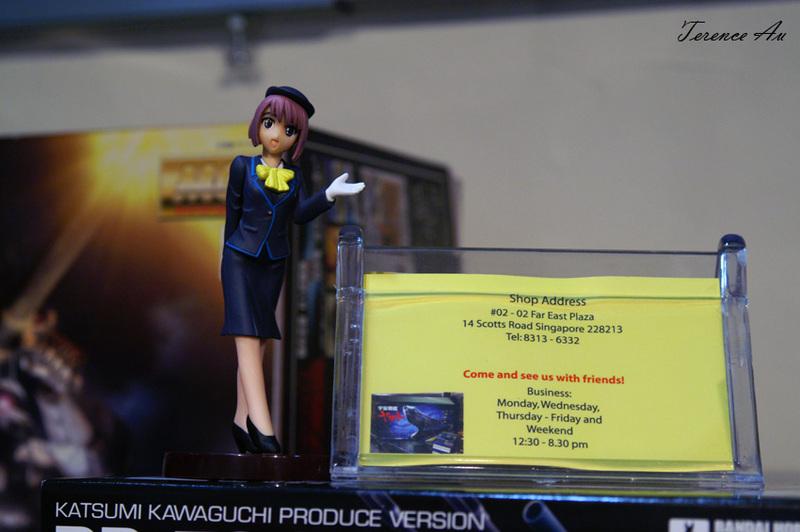 Thanks to one of my ‘girlfriends’, 祇園あおい, here is the address to アキバのホシ/Akiba no Hoshi! Image from Streetdirectory.Com, rights reserved. 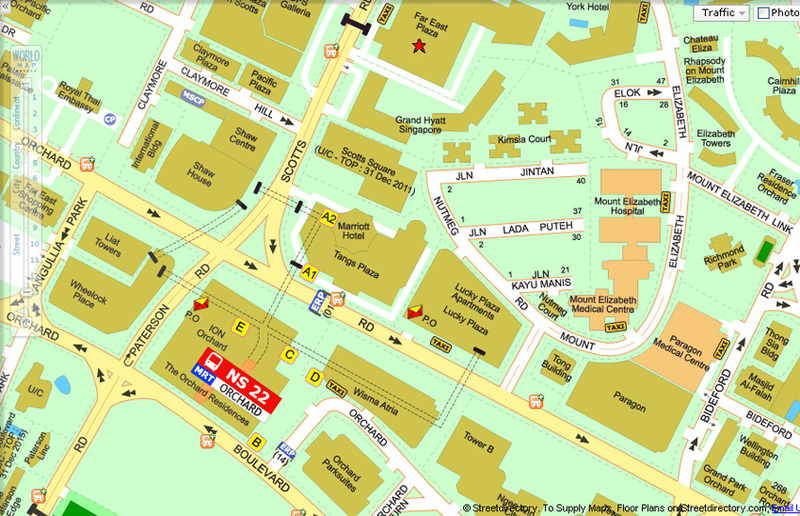 10-minute walk from NS22 Orchard MRT Station on the North-South Line. 10-minute bus ride from NS23 Somerset MRT Station on the North-South Line. Exit from ‘A’, head to the bus stop and take services 143/190 and alight at DFS Galleria/Tong Theck Building, cross the road on the pedestrian bridge to Far East Plaza. The Site Admin would like to thank Hidekiさん, the boss-of-the-day at Akiba no Hoshi, for his hospitality in making this promotion successful. Hidekiさん, ありがとうございます. 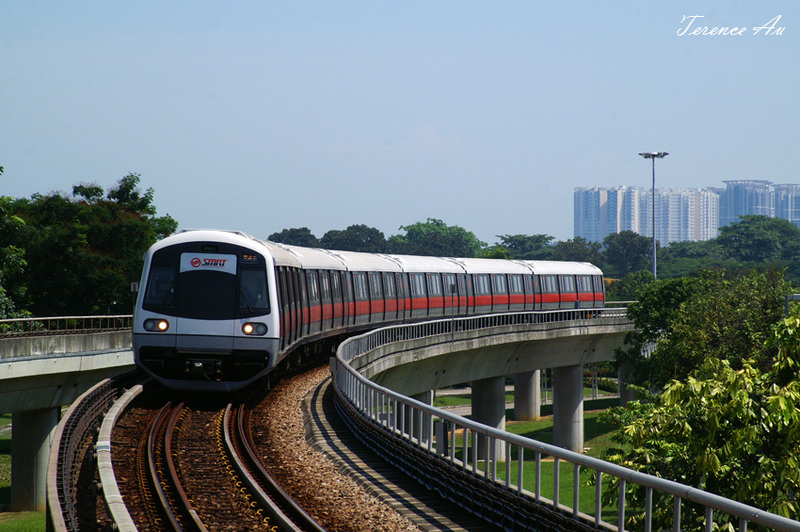 SINGAPORE: A northbound train was pulled out of service on Wednesday morning after a staff discovered graffiti on it. Initial investigation point to a breach in the fence at Bishan Depot, where the train was parked. The last time a similar incident took place was in May last year. A security lapse at SMRT’s Changi Depot enabled two intruders to spray-paint graffiti on one of the trains. That incident raised questions about security at important facilities here. Commenting on the latest incident, the Land Transport Authority said it is disappointed that SMRT failed to prevent another security breach at its depot. The LTA said the recent review by the Public Transport Security Committee has instituted a whole range of stringent measures to strengthen security at all train depots which SMRT has accepted. It said it takes a very serious view of the matter and will not hesitate to take SMRT to task, if investigations show the company did not comply with the necessary security standards at its depots. Police said they are investigating. SMRT said it has performed a complete check on its entire fleet of trains, and has stepped up security and patrols at its premises. In a statement, the police said it will not tolerate such acts which blatantly disregard the law. Anyone convicted of vandalism could be jailed up to three years, or fined up to S$2,000 and given between three and eight strokes of the cane. The penalty for trespassing into a protected place is a jail term of up to two years, or a S$1,000 fine, or both. With decreasing manpower in industries all over the World, would it be true that there are so few staff around to notice such graffiti damages, before the train leaves the depot? Letting the train into service with a ‘paint-job’ not designed for it will cause bad public image, before we talk about lawsuits and morality. Not only security should be stepped up, but deterrence on a whole must be enforced (caning doesn’t seem enough now). Generally, some kind of disregard for safety to bring a message across may be present in all these acts..
Singapore’s Minister of Transport Lui Tuck Yew wrote on Facebook on Wednesday evening about the upcoming policies that will be discussed and carried out for bus transport. Once again, let me thank you all for your feedback and comments. Some of you have taken the time and trouble to suggest various ways to improve our public transport system. I appreciate and take them seriously. In recent days, there were a number of announcements regarding our rail network. More trains and improvements to the Bukit Panjang LRT, the opening of the remaining 12 stations on the Circle line, additional trains to be purchased for the NSEW lines, SBST adding more than 490 weekly trips to the LRTs in Sengkang and Punggol. 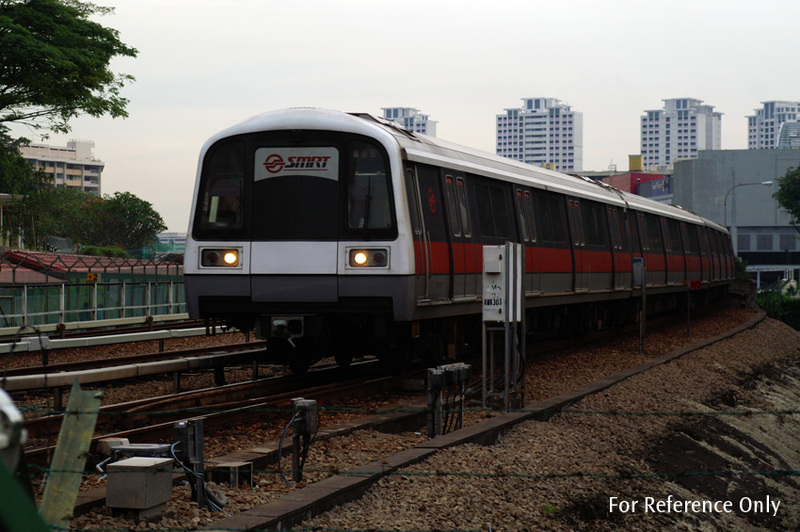 Later this week, SMRT will share their plans to add more train trips to improve frequencies during off-peak hours. We have other plans to purchase more trains (which we will announce soon) and to improve and extend our rail network over the medium to long term. However, these will take time. My primary and immediate concern is the commuters’ daily experience. The sensible thing to do, which is also a consistent feedback I get, is that we need to improve our bus services; this can be implemented more quickly and will provide some relief in the next few years until the ongoing works to significantly increase rail capacity is completed. I have therefore asked LTA to do a comprehensive review of our current bus service levels. The review will focus on what commuters need – improve bus capacity and congestion levels, frequency and reliability. The goal is clear – reduce waiting time, increase the predictability of bus journey times, improve our chances of getting onboard and provide better information to commuters. As part of this review, LTA and the PTC will work with the operators to raise the current Quality of Service (QoS) standards further. Once the review is completed, the PTOs will need to follow through to provide better service delivery to meet the higher standards that commuters are looking for. PTC will also need to audit and regulate more tightly to ensure these standards are met. I envisage the PTOs having significantly more buses (and bus captains) added to the existing fleet of about 4000 buses. We will also need to study carefully how Government can help the operators grow their bus fleet and captains in a sustainable manner. This comprehensive review will take some time and I have set LTA a target to have this completed by the 4th quarter of this year, together with a robust plan of action. It will also take some 12-18 months to get the new buses and, in the meantime, recruit and train more bus captains. But this is not good enough. My preference is to bring about some quick improvements on the ground. Therefore, I have asked LTA to work with the operators to allow some of the older buses which are nearing the end of their planned lifespan to be extended on a temporary basis, provided the operators and LTA ensure that the buses are road-worthy and safety is not compromised. I estimate that this measure will add about 5-6% of the fleet capacity until the arrival of the new buses. It is a more immediate measure which I’m confident will allow us to improve the current service levels in areas where they are most needed. How can you help? I encourage you to continue with the feedback you have been providing to the Grassroot Organisations and the LTA’s community relations officers on issues you encounter in your local area. This will be helpful to the LTA so they can carry out verifications and prioritise areas for improvements in the review. One measure that the Minister brought out was similar to the one the Site Admin have suggested in a post two months ago, that is to delay the scrapping of serviceable old buses until the next rail project is completed. The Minister may have meant otherwise, pointing to the 2-year extension that operators can opt to extend their buses’ lifespan (from 17 to 19 years). The Site Admin’s policy will be to extend serviceable buses till 2018, when the Downtown Line is slated for completion. Why? The reason is utilization. Injecting new buses into the system at too rapid a rate not only causes increased road congestion, as buses utilize the roads just like all other vehicles do. Emissions, one for the environmentalist, and one that the Site Admin will not touch on. ERP, Electronic Road Pricing, operators have increased expenses, and yet another reason to ask commuters for higher fares. Come 2018, when the Downtown Line is completed, there will be a new problem, where will the surplus buses go to? There may be complimentary route for the buses to run on. There may be little/no route withdrawals (as learnt from the North-East Line bus restructuring which cost North-East residents many bus options). But, there will be lesser usage of buses along the Downtown Line sector. To negate this, a new operator, one that is not existing in Singapore, have to run the Downtown Line, so that there is a competition between the bus and rail market. One competition not to keep operators on their toes, but introduce positive competition and negate the direct need for a bus-rail operator to ‘get rid of’ their buses when they have the operator’s license for Downtown Line. Argument: Will there be enough routes, enough demand (for both bus and rail), enough or surplus vehicles, when the Downtown Line completes? The Site Admin would like to invite readers to look from this viewpoint. Today that bus services are almost meeting/not meeting demand, the injection of new buses to meet the demand for the next 7 years could be carried out. 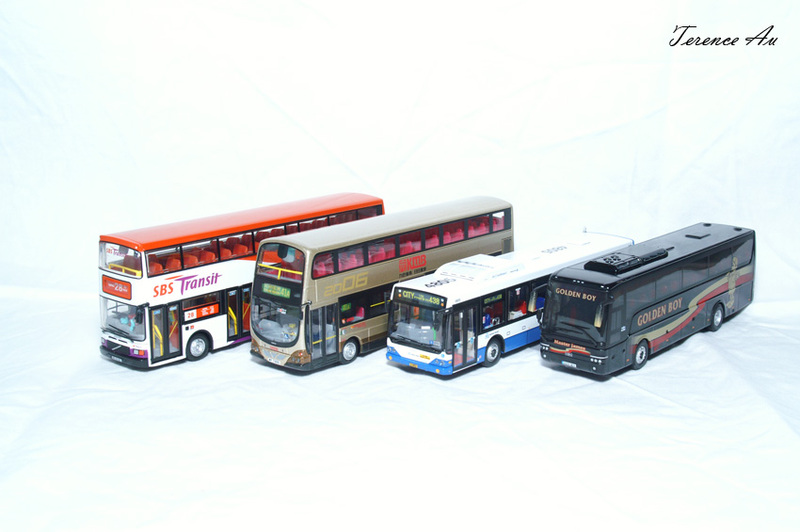 The amount of new buses can be over 1000 units per operator, both a direct replacement and addition for old buses which are retiring this year. The other option would be to extend these retiring buses by 7 years, maintain them in good running condition, and at the same time inject new buses that will become a direct replacement of the extended buses in 2018. Old buses will then be retired, new buses take over, there will be little surplus. Coupled with these is improvement in the information system for bus arrivals, one that operators can use the funds on which are planned for new buses. Better communications system to replace those used since the first ez-link card system. More manpower on the ground to maintain buses in good condition, maintain the running schedules and guide commuters in peak and disruption periods. You may argue that the buses will be still useful when the Downtown Line completes. There will be population rise, why omit the possibilities that these buses can be used for this? The Site Admin’s answer would be, why would the Downtown Line be built, with billions poured into the construction? In this transition from bus to rail as our main mode of transport which lasted the past 24 years, we are barely able to keep up with the transition, however utilization on rail has no doubt gone up though the years. More people take the rail than the bus, compared to 24 years ago. Moreover, rail will be the choice transport to commute to work, to head out for fun in the weekends in any large cities, and Singapore should work hard towards achieving this goal. No more time costly, long distance bus rides to work, but a fast and efficient rail service should be the way. The policymakers worked hard for the rail system to be the backbone of transport in Singapore. It has been proven in metropolises that rail services are more efficient, more speedy and user-friendly than bus transport. In this transition, we have seen degraded bus transport; operators should keep the operating standards high, while the commuters slowly realize and then move over the rail transport. Not to let the commuters curse at the bus services, then head over to the rail services to find it not ready for them. A system with little but sufficient surplus, together with an efficient system of commuter information, will beat a well-surplus system with continuing but insufficient development for the commuter. BEIJING: A Chinese high-speed train was derailed Saturday when it was hit from behind by another express, state media reports said, throwing two carriages off a viaduct and killing at least 11 people. The D3115 high-speed train, from Hangzhou to Wenzhou in eastern China’s Zhejiang province, was rammed from behind by the D301 express in its destination city, China National Radio said. The first train derailed and two of its carriages fell from an elevated track at around 8:30pm (1230 GMT), the official Xinhua news agency reported, citing local fire fighting sources. At least 89 people were injured, it said. Photos posted on Chinese websites and microblogs showed a long rail carriage standing vertically, with one end leaning on the viaduct and the other resting on the ground at least 10 metres (33 feet) below. A second carriage also was lying fully on the ground below the track, having apparently fallen completely off, with rescue personnel swarming over it. They also showed mangled metal sections of one carriage and people being carried away from the scene, although it was not clear whether those victims were injured or dead. Xinhua said the capacity of each car on the train was about 100 passengers. China National Radio quoted an unnamed Shanghai Railway Bureau official who had gone to the scene as saying the D3115 was halted by a lightning strike. The accident occurred less than a month after China inaugurated with great fanfare a new flagship $33 billion line from Beijing to Shanghai that halves the rail journey time between the two Chinese cities to five hours. It was opened on the eve of July 1 celebrations to mark the 90th birthday of China’s Communist Party and authorities touted it as yet another symbol of the country’s growing advancement. However, the new Beijing-Shanghai line has suffered problems with delays caused by power outages, sparking a slew of criticism online and in Chinese media. China has poured money into a massive rail expansion but the huge investments have spurred allegations of corruption, and raised concerns over costs and whether corners were being cut on rail safety. China’s state auditor has said construction companies and individuals last year siphoned off 187 million yuan ($29 million) from the Beijing-Shanghai project. The revelation followed the February sacking of former railways minister Liu Zhijun, who allegedly took more than 800 million yuan in kickbacks over several years on contracts linked to China’s high-speed network. The official China Daily said Monday the power supply incident on the Beijing-Shanghai line had raised fresh concerns over the safety of the landmark link, which opened a year ahead of schedule. Similar trains are used on the line where the accident occurred, which was operating before the new Beijing-Shanghai link. In April 2008, 72 people were killed and more than 400 injured when one train derailed and another collided with it in the eastern province of Shandong. The accident raised transport safety concerns for the Beijing Olympics just months later. Regardless of language, the news has spread like hellfire for the last evening. The accident occurred at 2030h Beijing Time on the Hangzhou-Fuzhou-Shenzhen Passenger Dedicated Line (PDL), part of the China High Speed Rail (HSR) network. Trains involved are CRH2-139E formation of 16-car travelling as D301 which rear-ended D3115, a CRH1 of unknown formation. The CRH1 is a Bombardier venture with CSR China Qingdao Sifang Locomotive and Rolling Stock Company. They have a maximum speed of 220 to 250 km/h depending on batch. CRH2E is a spin-off from the CRH2A, originally built based on the Shinkansen E2-1000 currently serving the JR East Tohoku Shinkansen (東北新幹線). Using technology provided from Japan through the original CRH2A trains, CSR Qingdao Sifang built the subsequent series of CRH2, and claim that they ‘import technology, digest and revolutionize’. Kawasaki Heavy Industries (which made the CRH2A) and CSR Qingdao Sifang China has since ceased collaboration on high speed rail development, however..
stocks such as the C151A (SMRT: KSF) supplied overseas are not affected. Questions about to be raised on quality and safety? Interestingly to share, the Site Admin has foreseen the China HSR network to meet with a major incident this year, due to the rushed projects, power and signalling system failures that occur at a increasing rate. Tragically true, this accident has claimed lives, one accident which no one expected nor wish to happen. The Site Admin prays for the victims involved, and hopes for positive future development in China about the correct attitude and direction to head in HSR development. Rome is not built in a day, HSR cannot be a rushed (and corrupt) project. 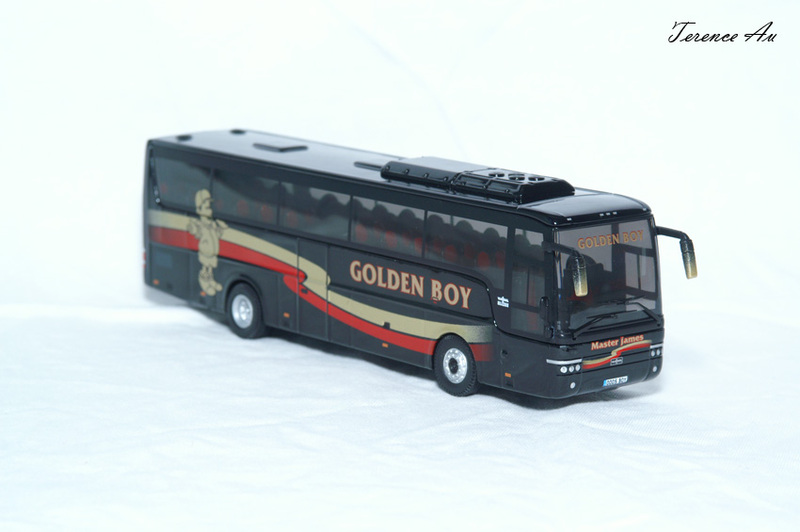 Van Hool was founded by Belgian Bernard Van Hool in 1947 as a coachbuilder. Presently, it employs 4500 worldwide and produces 1700 buses and coaches and 5000 trailers annually. Van Hool coaches are well distinct from competitors by its unique design. 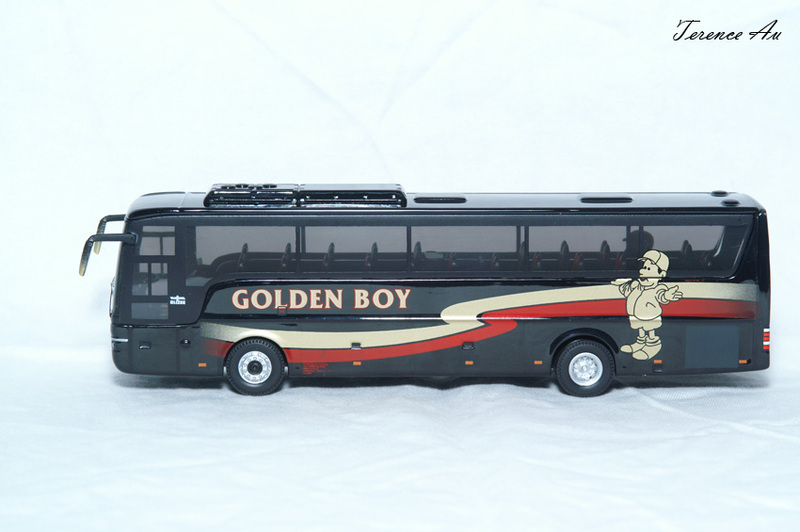 In Asia, Van Hool products can be easily found in Japan, where customized Astromega (commonly TD824) coaches and some with Volvo B10M chassis incorporating a high floor, lower-aft lounge that can only be found in Japan. Locally in Singapore, SBS Limited purchased a Van Hool Alizee (T9) bodied Volvo B10M Mark 1 for try-out. 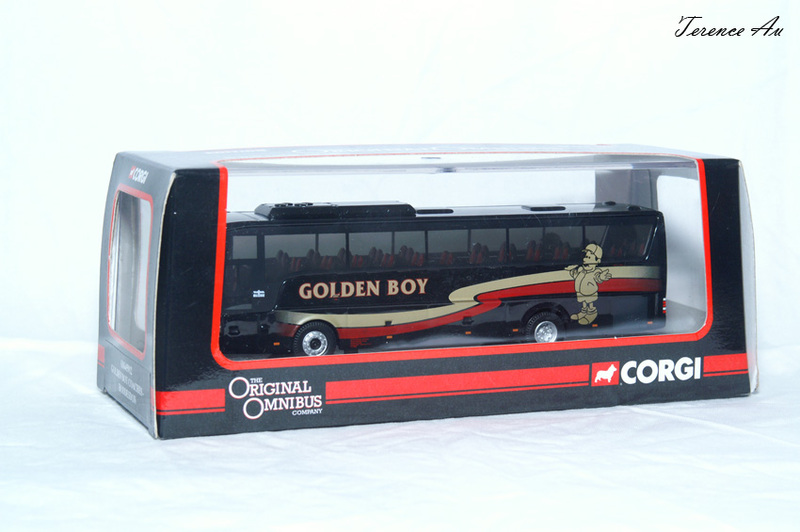 Registered SBS9C, this bus lasted till the end of its license lifespan. AB Volvo (Volvo Corporation) founded 20 years earlier than Van Hool in 1927 by AB SKF (Svenska Kullagerfabriken AB), a Swedish company that manufacture bearings. Volvo Buses became an independent division in 1968, and currently is the second largest bus manufacture in the World. 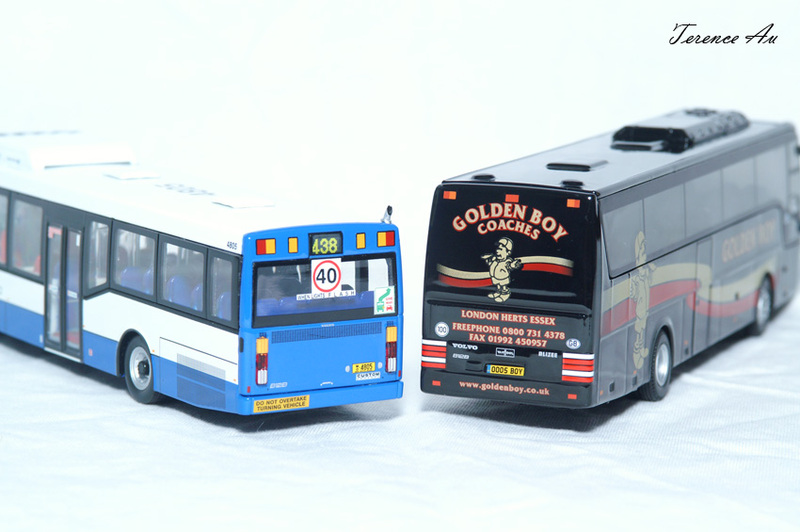 The Volvo B12B chassis range was introduced in 1997 as a replacement for the B12 and B10B. Equipped with a DH12C (later the D and E models), the six cylinder turbocharged-intercooled diesel engine has output ranging 340 to 460 horsepower (DH12E). Operators in Europe and Australia (the latter having B12BLE citybuses) own majority of them. 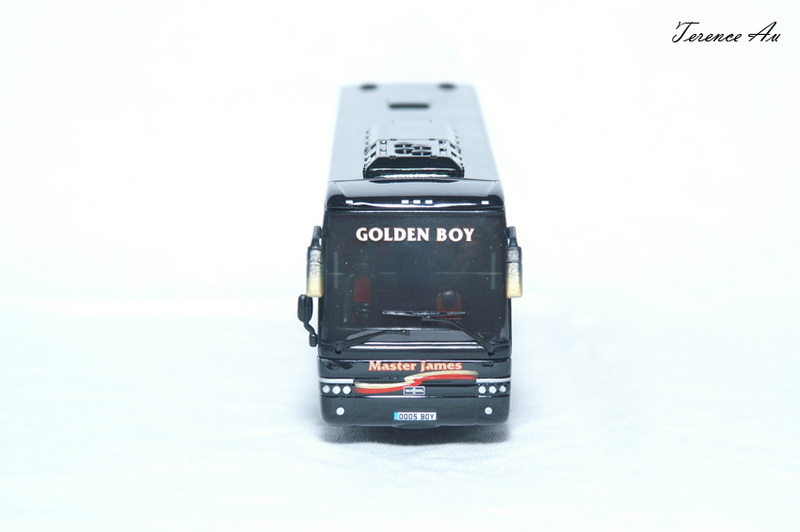 The model to be introduced this month is a combination of all-of-the-above, a Belgian product of quality, a brand well known in the bus industry and a chassis common for touring coaches. 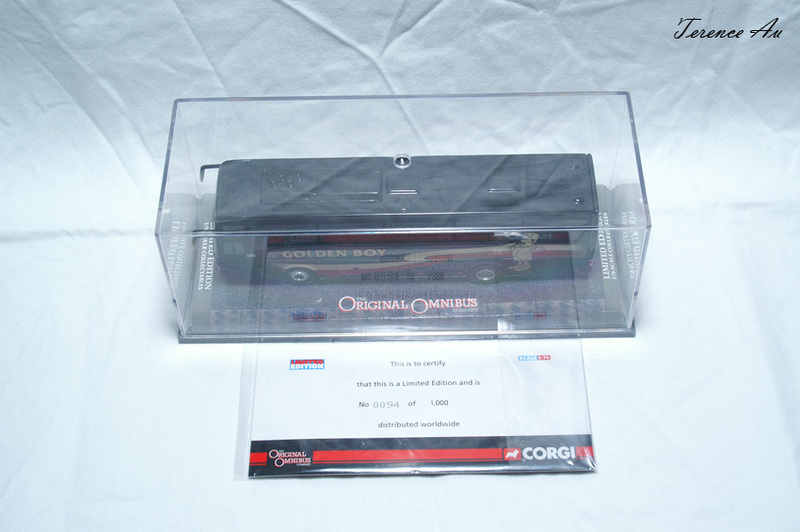 A Graham Farish (Bachmann) N-scale 20-ton toad brake van was also shipped. 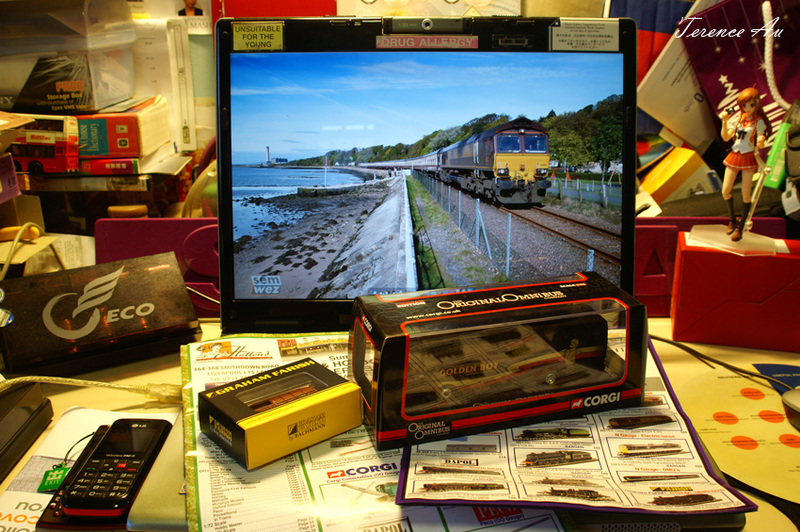 A needed addition to the Site Admin’s N-scale railway fleet. 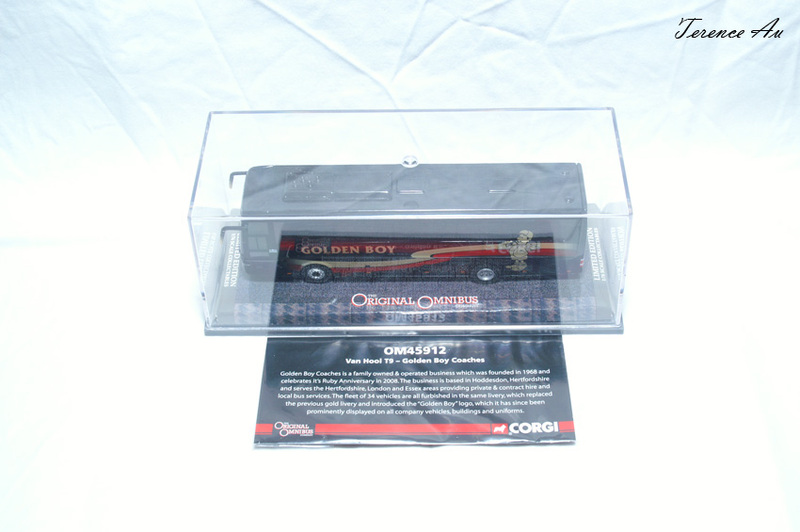 The common box from Corgi. 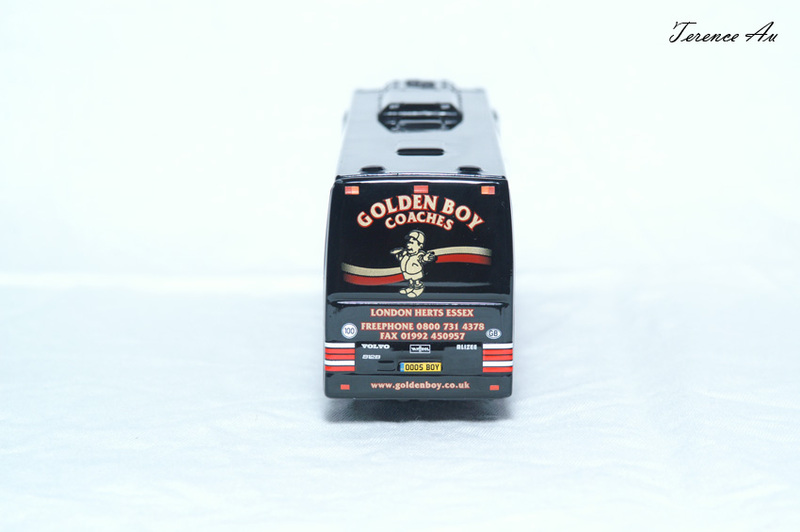 Description of the featured company, Golden Boy of United Kingdom. 94th unit out of 1000. The lowest running number in the fleet till date. Front view with the namestake, Master James. 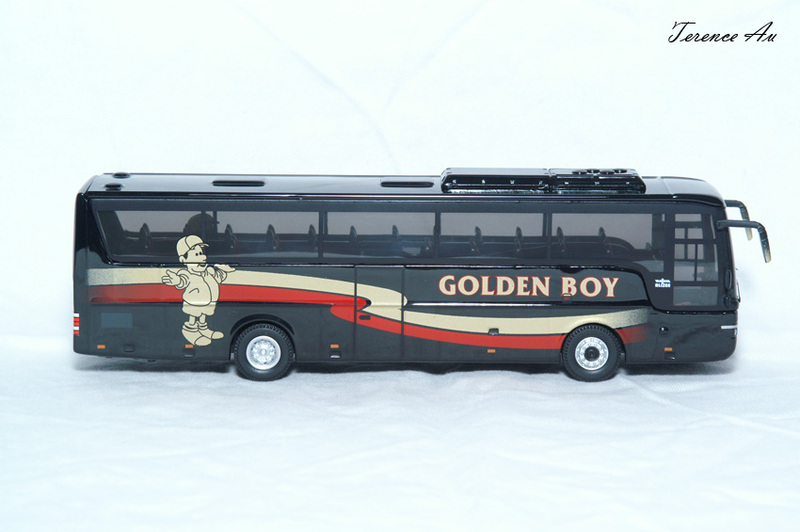 The main reason why the Site Admin chose this model over others which depict DAF SB4000 coaches; the complete Volvo, B12B, Van Hool and Alizee identifications. What can be more unique and full of identity? Instead of two standard issue mirrors (with built-in electrical adjustment and heating as of the real machine), there is also an assisting mirror faithfully depicted in the model. A quality touch indeed. 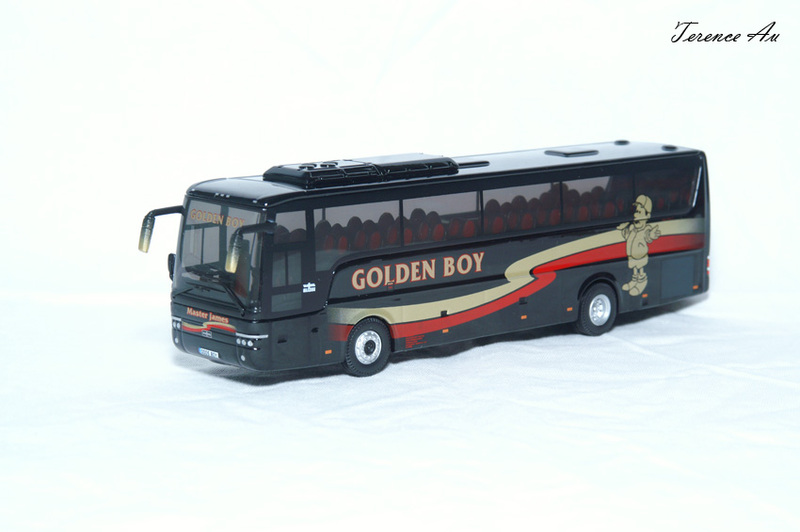 What is the fun of collecting transport models? You can have ‘long lost brothers’ meet up at a single place! The B12B from UK, and the B12BLE with Sydney Buses from Australia. The quest for details is a long existing syndrome in the model world, no matter if its the Orient (Creative Master Northcord/B12BLE) or the Europeans (Corgi Diecast/B12B), the identifications are faithfully depicted, even as the real vehicle looses them over the years of service..
Last but not least, a demonstration of transport power; with a lineage of Volvo Buses products over the years! 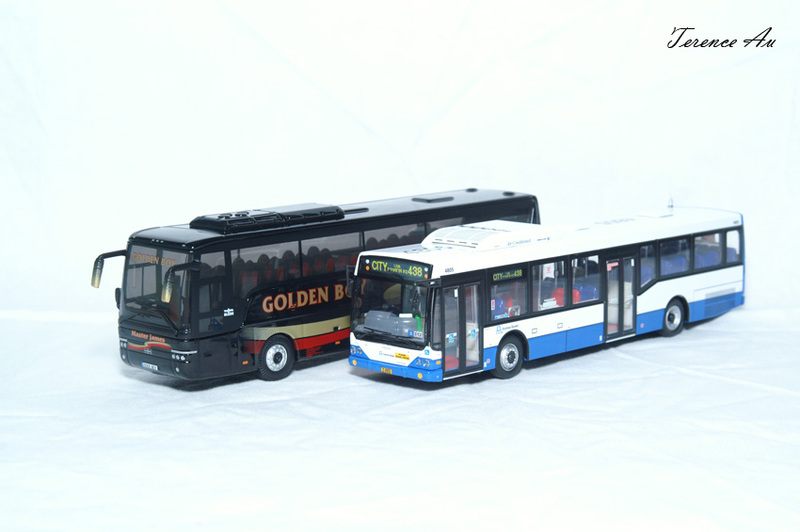 The Volvo (Leyland) Olympian, B9TL, B12BLE and B12B.